Energy performance is a key benefit of green roofs. 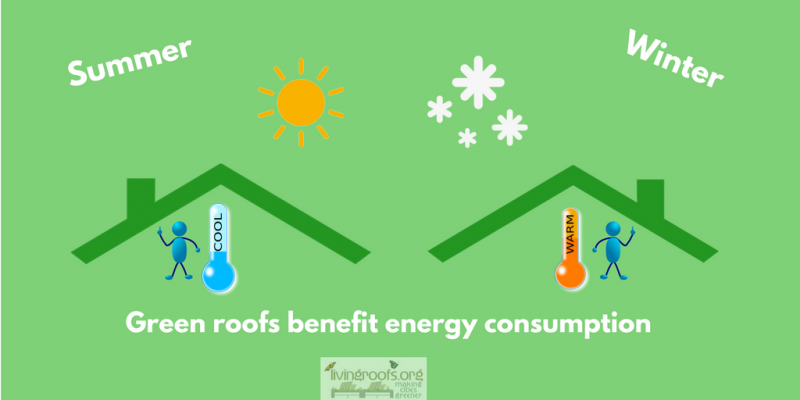 Whilst green roofs are important for cooling cities as a whole, a green roof can roof can also have a positive impact on the energy balance within any given building. This is particularly relevant if a building has poor insulation and poor ventilation. This can lead an increase air conditioning and therefore increased energy use. Studies have shown that the membrane temperature beneath a green roof are lower than where the membrane is exposed. The National Research Council of Canada also noted temperature fluctuations. During spring and summer temperature on a conventional roof were of the order of 45ºC. Under a green roof, however, the fluctuations were in the order of 6ºC. The positive effect on the temperature of the membrane under a green roof protects the membrane from the effects of UV, frost and sunlight. Importantly this also moderates heat flow through a building by shading, increased insulation and thermal mass. The soils and plants evapotransipirate thus dissipating the heat back into the atmosphere. Green roofs do provide potential energy savings by improving building insulation characteristics. Yet it is difficult to give them a fixed U-Value rating. This is because green roofs are dynamic systems and their properties vary throughout the year. Studies in Germany have provided various estimates. Figures attributed to Zinco estimate that 2 litres of fuel oil are saved per m2 of green roof per year. A more recent study of domestic buildings in North East German with flat roofs suggests that there is a 3-10% winter saving on fuel bills. The results of the study over five years suggest that there is a maximum saving of 6.8kWh/m2 (1.5kg/m2 CO2 e tonnes) and a minimum saving of 2.0kWh/m2 (0.44kg/m2 CO2 e tonnes) during the winter. The City of Toronto has estimated that the direct energy savings citywide. The reduced energy for cooling through wholescale city greening, would be in the order $22 Million. This is equivalent to 4.15kWh/m2 per year (a CO2 emission saving of 1.7kg/m2). There would also be a reduction in peak energy demand in the order of 114.6MW. This would lead to fossil fuel reductions in the region of 56,300 metric tonnes per year. Studies by Environment Canada have shown that the upper floor of a building with a green roof is likely to save 20% of its energy demand by reducing its need for cooling. This study also calculated the reduction on floors below the upper floor. The summer savings on the top floor of the building would be in the order of 20%. If a building is five storeys or more, the total summer savings would be in the region of 6% and with a two-storey building, the total summer savings would be between 10 – 12%. An energy study undertaken by the City of Chicago estimated that, with whole scale greening of the city’s rooftops, energy to the value of $100 Million could be saved each year due to reduced demand for air conditioning. This would to a reduction in peak demand in the order of 720MW.